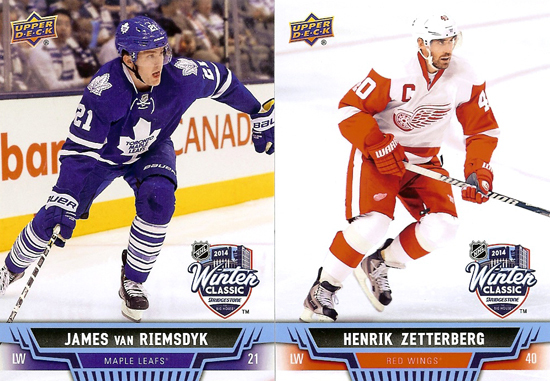 Upper Deck Creates a Special 20-Card Set for the 2014 NHL Winter Classic® Available at the Big House! The NHL Winter Classic® has quickly become not just one of the biggest NHL® events of the year, but one of the biggest sporting events of the year. The NHL® has quickly established New Year’s Day as a day they own by showcasing an amazing sporting event with two great teams at a historic venue. This year is no different as the Toronto Maple Leafs head to the Big House in Ann Arbor, Michigan to take on the Detroit Red Wings. Crews have been working tirelessly to make sure the stage is set for one of the biggest games of the season. Watch as the stadium is transformed to an outdoor hockey arena! Celebrate the New Year with Upper Deck at the Big House in Ann Arbor and you will score a free pack of these special NHL Winter Classic® cards! Every fan in attendance will receive a FREE pack of these cards and Upper Deck will have a booth set up at the venue where fans can score more packs to trade in order to complete the entire set. And it won’t just be about trading at Upper Deck’s booth as fans will have the opportunity to get their very own personalized Upper Deck trading card produced at the venue for FREE! Get to the Big House early so you can score some of these awesome collectibles! 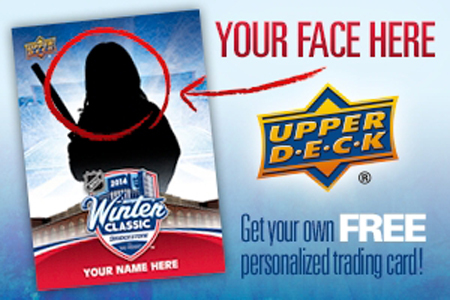 Get your very own Upper Deck NHL® trading card made at the Big House on New Year’s Day! Is there any way that you can obtain these cards without being in attendance? Will you be selling complete sets of the Winter Classic Cards On-line? I was at the game and couldn’t find a booth. Sorry guys, the sets were only distributed at the game. Your best bet to find them now would be online auction sites like eBay. What a shame that “true” collectors can’t put together a set without those selling them on ebay looking for a quick albeit outrageous buck! All of us collectors buy your products year round and then get the shaft because we were not one of the financially well off to afford tickets to this game.